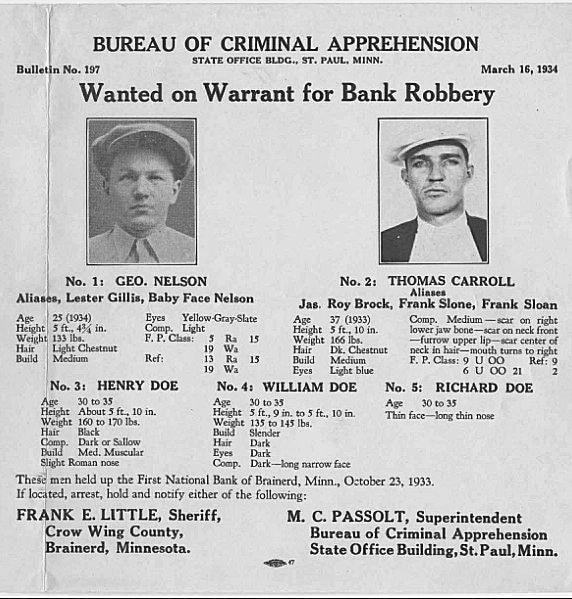 A wanted poster for Nelson and Carroll. It also notes three other "unknown" suspects, likely Charlie Fisher, John Paul Chase and Homer Van Meter. On Oct. 23, 1933, Carroll, Nelson, John Paul Chase (Nelson's longtime partner), Homer Van Meter, who had recently been paroled from Jefferson City, and Charlie Fisher hit a bank in Brainerd, Minn., for $32,000 (about $585,000 in today's money). Flush with cash, Carroll headed to the relative safety of Minneapolis but was almost arrested on Nov. 11 when he was spotted by two detectives who recognized him from police dispatches. He managed to escape, however. The following month, Carroll, Nelson, Van Meter and Fisher were in San Antonio, Tex., where they had gone to purchase weapons from Hyman Lehman. A talented gunsmith, Lehman modified powerful weapons for many high profile criminals of the era, including Nelson (a regular customer) John Dillinger, “Pretty Boy” Floyd, “Machine Gun” Kelly and members of the Baker-Karpis Gang. Among his modifications was to take a standard .45 and give it both an extended magazine and barrel and then add a front grip. Such a weapon could be easily concealed, but when used, it could be fired like a machine gun. On Dec. 11, Carroll was identified by San Antonio detectives H.C. Perrow and Al Hartman and a chase ensured. They were able to corner Carroll in a blind alley and shots were exchanged. Perrow, a 15-year veteran of the department, was killed and Hartman was wounded. Carroll managed to escape but he had been seen. According to statements Lehman later made to the FBI, Carroll returned to Lehman’s shop and borrowed an old pair of pants which he put on and then walked away from the shop. There is no evidence that Lehman was aware at the time that Carroll had just killed a police officer. The gang next surfaced on March 6, when Carroll, Nelson, Van Meter, Eddie Green, John “Red” Hamilton and John Dillinger, who had escaped from the Crown Point, Ind., jail just three days earlier, stole $49,500 from a bank in Sioux Falls., S.D. Carroll was assigned to watch the street and would eventually hold several police officers at gunpoint outside the bank while the robbery was in progress. Nelson, however, shot and wounded motorcycle officer Hale Keith as they made their getaway and returned to St. Paul. The bank robbery was actually caught on camera as dozens of onlookers watched. A photographer was in the area most of the morning and when the robbery began, onlookers assumed it was being staged for the camera and simply stood and watched it unfold. In this photo, Carroll is standing behind police hostages Ray Donahue and Homer Powers. The curious onlookers are evident in the photo. They had no idea it was a real robbery. Although faces are not clear in the photo, the two police officers identified Carroll as the gunman who held them hostage. They said he was calm and soft-spoken but firm in his commands. A typical example of Lehman's modifications. After the incident at the Little Bohemia Lodge, Minnesota issued an identification card for Carroll using his 1933 St. Paul arrest photo. Just a week later, on March 13, the gang struck again. This time, it was the First National Bank in Mason City, Iowa. At $52,344, it was the gang’s largest haul, but it came with a price. 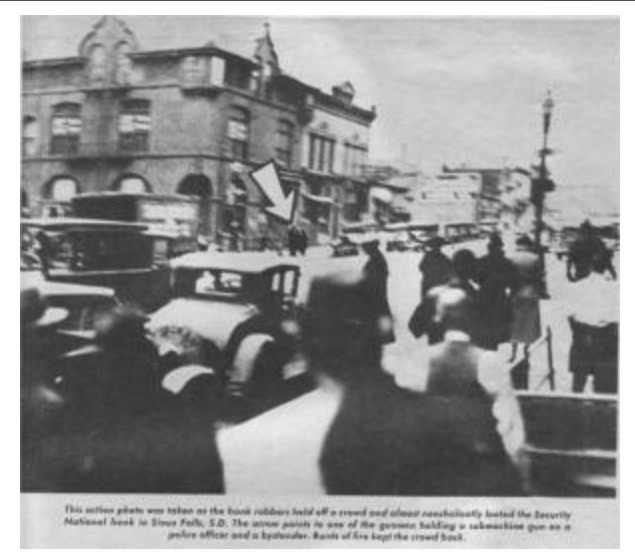 Both Dillinger and Hamilton suffered gunshot wounds as they exited the bank. As the gang left the bank, Nelson fired a burst from his machine gun, and several of the bullets struck the exterior of the bank, chipping cement and leaving marks. Those marks were left on the bank as a piece of local history and were still visible into the 1970s. With the heat intensifying, they decided to hide out at the remote northern Wisconsin lodge of Emil Wanatka, a former minor player in the Chicago underworld who had opened his Little Bohemia Lodge just a few years earlier. The gang was there for less than 36 hours before word reach the FBI and, on the night of Sunday, April 22, Melvin Purvis, who headed the Chicago office of the FBI, led a raid against the lodge. The raid resulted in disaster, with agents killing one civilian, Eugene Boisoneau, 35, from the nearby Mercer CCC camp, and wounding two others, John Hoffman, 28, a gas station attendant, and John Morris, 59, the Mercer CCC camp cook. The three exited the lodge and were attempting to drive away just as the FBI arrived. Thinking they were gang members, the FBI ordered them to halt. However, the trio had the car radio on and didn't hear the command. When they continued to drive away, Purvis gave the order to shoot and agents opened fire on the car with a variety of weapons. The shooting alerted the gang, who were quietly playing cards in the lodge's bar area. As the shooting continued out front, the gang easily escaped by jumping out a back window and running along a lakefront behind the lodge. During the escape, the gang became separated and Nelson came out of the woods at the nearby lodge of Alvin Koerner, just south of the Little Bohemia Lodge. It was here where he was nearly cornered about an hour later by agents and the local sheriff. They had gone there to question Koerner and had no idea Nelson was hiding in the lodge. Nelson came out shooting and he killed Agent Carter Baum and wounded Agent Jay Neuman and local constable Carl Christensen as the three drove up Koerner’s driveway. He escaped in the agents' car. A short distance away, Dillinger, Hamilton and Van Meter also stole a car from a local resident and escaped. Carroll, meanwhile, had fled through the woods and ended up in a nearby crossroads community where he stole a car and drove down a logging road 12 miles north of the lodge. When the road turned out to be a dead end, he left the car and escaped on foot. Although the gang escaped, three women - Nelson’s wife Helen Gillis, Mary “Mickey” Conforti, Van Meter’s girlfriend, and Jean Crompton, Carroll’s girlfriend - were all arrested and charged with harboring fugitives. After trial, the three were sentenced to probation and released. They simply broke probation and returned to the men. Meanwhile, Carroll, Dillinger and Van Meter eventually reunited and hid out in a cabin outside East Chicago, Ind. On May 19, the three, as well as Nelson and Hamilton, were all indicted by a federal grand jury in Madison, Wis., and charged with harboring each other as fugitives. Later that month, Carroll reunited with Crompton and the pair left for Iowa, Carroll’s home state.